We’ll learn soon enough just how foolish it will be to ask that of the 2017 Cincinnati Reds, but whenever I think about how an upcoming season might play out, I inevitably think back to the strike-shortened season of 1994. Like last year’s Orioles, the ’94 Reds weren’t expected to make much noise in the newly-created NL Central, having won just 73 games during the previous season. But following a quick start, the Reds bolted to the top of the division and were still there Ã¢â‚¬â€œ if only by the slimmest of margins Ã¢â‚¬â€œ when the longest work-stoppage in major league history began on August 12. Of course, it’s possible that the Reds would have crashed and burned during the final six weeks of the regular season and missed the postseason entirely, especially considering that there was only one Wild Card team in each league at the time. I’ve always preferred to imagine the opposite, though. 1993 was a disappointing, albeit transitional, year for Cincinnati. Coming off a 92-win season in 1992 Ã¢â‚¬â€œ an 18-game improvement over the Reds’ 1991 campaign Ã¢â‚¬â€œ new GM Jim Bowden made a flurry of moves in the offseason, including trading Norm Charlton to Seattle for Kevin Mitchell, trading Paul O’Neill to the Yankees for Roberto Kelly and signing free agent pitcher John Smiley. 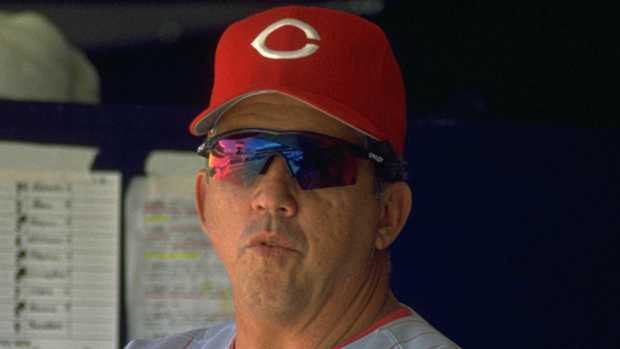 Meanwhile, Reds legend Tony Perez succeeded Lou Pinella as manager, yet after just 44 games (a stretch during which Cincinnati went 20-24), Perez was fired and replaced by Davey Johnson. From that point, the team played .500 ball through Sept. 3, but the season’s final month was an eyesore, as the Reds lost 19 of their last 26 games. Going into 1994, when the Reds moved out of the NL West and into the newly-created NL Central, Cincinnati made only a handful of transactions, most notably signing veteran free agent third baseman Tony Fernandez and trading reliever Bobby Ayala and catching prospect Dan Wilson to Seattle for second baseman Bret Boone and starter Erik Hanson. Still, even though they no longer had to compete in the same division as the Braves (who began an amazing 14-year division championship streak in 1991), the Reds weren’t viewed as serious playoff contenders going into 1994, especially considering the degree to which the previous season ended in a thud. 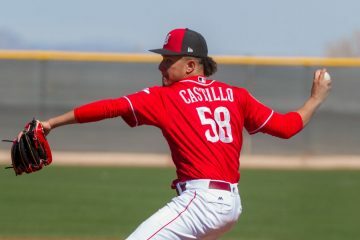 While Opening Day didn’t inspire much optimism as the Reds made three errors in a 6-4 loss to the Cardinals, the next three games Ã¢â‚¬â€œ not counting an April 6 game that was suspended in aÃ‚Â sixth-inning tie due to rain Ã¢â‚¬â€œ saw the team win one-run nail-biters. Games five through seven, meanwhile, were won emphatically by a combined margin of 23-10, and after the first week of the season, the Reds were atop the Central with a record of 6-1. They cooled off a bit throughout the remainder of April, but by month’s end, the team had won 15 games, lost just 7 and held a 2.5-game lead over second-place Houston, then a member of the National League. Smiley had pitched well to that point, with an ERA under 3, while Boone and first baseman Hal Morris sported batting averages north of .300. Then 17 games over .500, the Reds began the second half with a one-run loss to Chicago before going 9-7 over the remainder of July. Heading into August, the team enjoyed a 2.5-game lead over Houston. They then completed a 6-1 West Coast road trip by sweeping the Giants, including a 17-4 shellacking on Aug. 3 that extended their division lead to 3.5 games. That win saw Mitchell go 5 for 5 with 5 RBI, bringing his season line to a robust .328/.430/.686 Ã¢â‚¬â€œ numbers that actually exceeded his totals during his 1989 MVP campaign. On Aug. 5, the Reds returned to Riverfront Stadium, where at that point they had won 35 of 52 games. Against a tough Atlanta rotation, however, the team dropped 3 of 4 just as the Astros were hitting their stride. After winning six in a row, Houston — led by eventual league MVP Jeff Bagwell — found themselves a mere half-game back of the Reds when they began a three-game series with the lowly Padres on Aug. 9 as the Reds hosted the West-leading Dodgers. That night would see the Reds’ final victory of 1994 Ã¢â‚¬â€œ a 5-3 win over knuckleballer Tom Candiotti that was highlighted by Reggie Sanders’ 17th homer of the year. 24-year-old rookie starter Kevin Jarvis, who would go on to pitch another 52 games for Cincinnati before being waived in early 1997, earned his first major-leagueÃ‚Â win. Nursing a 1.5-game lead, the Reds sent Smiley to the mound on Aug. 10. For seven innings, he was superb, allowing just three singles and one intentional walk. He even helped his own cause at the plate, singling to score Eddie Taubensee in the bottom of the 5th. The clock struck midnight in the 8th, however. With the Reds clinging to a 2-1 edge, Smiley gave up a leadoff double before retiring the next two batters. After walking Delino DeShields on a full count, he was lifted for reliever Hector Carrasco, who gave up a game-tying single to Mike Piazza on his first pitch. After the Reds eked out a run in the bottom of the inning to regain the lead, Jeff Brantley promptly set the dumpster fire ablaze by giving up a home run to Eric Karros. Two batters later, he was lifted for Chuck McElroy, who was unable to retire any of the four batters he faced. By the end of the half-inning, the Dodgers had rallied for four runs and the Reds lost 6-3. 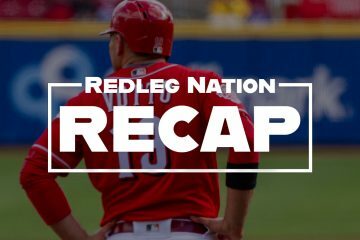 Houston, meanwhile, downed San Diego 3-1, cutting the Reds’ lead to a half-game once again. The following day, although Sanders, Boone, and Fernandez had two hits apiece, the Reds couldn’t plate a run, wasting an 8-inning, 12-strikeout start by Rijo. Their 2-0 loss was rendered moot, however, as the the Padres bested Houston 8-6. As the strike began on Aug. 12, the Reds led the NL Central with a record of 66-48. Just over a month later, acting commissioner Bud Selig formally canceled the remainder of the season. For the first time since 1904, there would be no World Series. When the strike took effect, Atlanta was the leading Wild Card contender, with a 2.5-game lead over the Astros. By the same logic, let’s give the Braves the benefit of the doubt and assume that they would have also earned a slot in the postseason. In the West, the Dodgers were only two games over .500 but still held a 3.5-game lead over San Francisco, so it seems prudent to pencil them in as well. That brings us to the NL East, where the Expos sported a gaudy 74-40 record (which, at 162 games, projects to 105-57) and would have surely ended the Braves’ division title streak at three had the season not been cut short. Most articles about the 1994 season assume that Montreal would have won that year’s World Series had the strike never taken place. Because they couldn’t have faced a Wild Card team from their own division, they likely would have faced the Dodgers in one of the two inaugural National League Division Series, leaving the Reds to faceÃ‚Â the Braves. While Cincinnati would have likely been considered the underdog in the latter series, the playoffs are predictably unpredictable, so let’s assume home-field advantage meant more in October than it did in August and that — unlike the following year — the Reds managed to overcome Maddux, Glavine and company. Let’s also assume the Expos got by Los Angeles. Could the Reds have stood a chance against Montreal? At the risk of reading too much into small sample sizes, the teams played each other six times in 1994. In April, the Reds took two of three at Olympic Stadium and only lost game #3 in dramatic fashion as Carrasco yielded a walk-off single. The following month, the Expos traveled to Cincinnati, where they again dropped the first two games before Carrasco struck again, giving up three runs on three hits in a 10-9 loss. That said, the Reds more than held their own against the league’s top team, and assuming Johnson would have only used Carrasco for mop-up duty, it would have been exciting to see if the same held true in October. Team stats pointed toward a close matchup as well. The Expos were first in the league in run differential; the Reds, second. The Reds led the league inÃ‚Â hits and had its highest team batting average; Montreal ranked third and second in those categories, respectively. The Expos had the league’s best team ERA; the Reds ranked third. The Expos’ had the edge in the outfield, where their collective WAR was 9.2 to Cincinnati’s 3.7; the Reds had a better infield, with a collective WAR of 4.0 to Montreal’s 0.1. The Expos had a stronger starting rotation according to WAR; Carrasco meltdowns notwithstanding, WAR considered the Reds’ bullpen superior. And so on. I’m sure fans of the Expos, Dodgers, Braves and Astros all have their own Ã¢â‚¬Å“what if?Ã¢â‚¬Â scenarios in whichÃ‚Â their preferred team faced the American League pennant winner in the 1994 World Series That Never Was. It still stings that we’ll never find out what would have actually transpired, especially considering that only three of the following 22 seasons ended with the Reds atop the NL Central. And while it’s highly unlikely that this season will break that trend, it’s still fun to conjure up ways in which the 2017 Reds might manage to defy expectations: What if Devin Mesoraco and Homer Bailey finally get healthy? What if Joey Votto has more than a torrid second half? What if Anthony DeSclafani turns into a true ace? What if Bronson Arroyo can outwit Father Time? We’ll learn the answers to these and other questions over the next six months, but for now, anything is possible. I still remember being at conservation camp when they announced that the Reds were in first place when the strike began. Everyone cheered — we were too young to contemplate that the World Series might not actually happen, and we were still young enough to believe the Reds would win it all, just as they had in ’90 when we were the underdogs to the A’s. I don’t think anyone contemplated that the Series wouldn’t happen. Not sure how someone who presided over such a debacle was eventually promoted and inducted into the Hall of Fame. The White Sox were also in first place when the strike started. With 1994 being the 75th anniversary of the “Black Sox” 1919 World Series scandal of throwing the series against the Reds, I was really rooting for a rematch of those two teams. A White Sox/Reds series would have been great. Sports Illustrated imagined how the season would play out and had the Cubs surging to score a playoff spot, getting past the Expos and then facing the Red Sox in the Series. Funny how quaint that seems now, after the Sox have won three in recent years and the Cubs are favored to repeat this season. Are you sure? The Cubs were like 49-64 or something like that at the strike. The Red Sox were also bad. Something like 51-62. Both, were 15-20 games out of a playoff spot at that point. I’d recheck that article. Oh, I see now it was meant to be funny. I thought you meant they seriously believed that would happen because there was no way that Cubs team would have sniffed the playoffs. 70 wins maybe but no playoffs. They were terrible. Those 94 and 95 teams were really strong. I don’t know if the 94 team would have gotten past the Braves, especially since they didn’t in 95. They fell short against them in that 3 game series in 94. Would have been great if we could have found out though. The 95 playoffs were strange because coming off the strike, we couldn’t even sell out a playoff game. So many fans were upset. The energy was different. Atlanta would have definitely been a tough draw, but in ’95, I think (and I might well be wrong) that they were still getting stronger while the Reds were getting older. In ’94, the teams split their season series 5-5, which is another reason I think the playoffs would have essentially been a coin flip. Maybe, but I think that coin would have been slightly weighted in the Braves’ favor. Short series against that rotation = no bueno. And even if they got past the Braves, odds are, they would have faced the Expos and the odds are even greater that the Expos would win that series. But, as you say, the playoffs are predictably unpredictable, so who knows? Just wished we could have found out. I think the Reds should add a 1995 World Series??? flag at GABP with the question marks included. I went to about 20 or so games in 1994 and closely followed the team. I was working at the TGIFridays at Covington Landing as a summer college job and and the other servers and user would often decide last minute to go grab a $3.50 nose bleed seat and then move down after few innings. We also regularly saw the Reds players, like Kevin Mitchell and Deion Sanders, at the TGIFridays – Kevin liked to wear leather vests and no shirt underneath and Deion was a class act all the way – both were great to the staff. That strike costed me 15 or so years of not following baseball. Between the strike and the steroid era, I almost didn’t come back. I wish the Reds were good today. But I’m really just happy to go to the games and listen on the Radio on summer nights. I finally made into Diamond Seats last year – a long way from $3.50 nose bleeds. But baseball is just as fun as it was before the strike. Eh, the other strike year, when we had the best record in baseball but didn’t win either “half” season and got shut out of the playoffs bugs me even more. They should hang a flag for that season, with an asterisk. The biggest moment of that season didn’t come up in your fine article! I think that the season being cancelled and the very close call to being the DEMISE of Major League Baseball is the reason we haven’t been that close again! I think the owners and Players union understood they just about killed the goose that laid the golden egg! The ignorant greed of both sides continues to be an issue but they seem to understand the fans don’t have to have MLB!!!!!! I remember those next 2 seasons the fans were pi&&ed and had it not been for a super ball wrapped in rawhide and 2/3rds of the league juicing MLB would have folded!!!!!!!!!!!!!!! Good stuff – thanks, Clay! I’d love to see similar retrospectives of the ’81 and ’99 Reds – they really got jobbed both of those years. 1981 – Why on earth would the powers-that-be decide on a split-season in ’81, rather than just picking up where they left off? Just seems like such a strange decision to me, and I’m not even talking as a Reds fan there. Lots of drama and intrigue (and 2 really good teams) in those years.